Decoral is a sans serif typeface created by Lasko Dzurovski and published by Totem which is available in 3 weights (Light, Regular, Bold) each with over 650 glyphs, Stylistic sets, useful OpenType features and multilingual support. 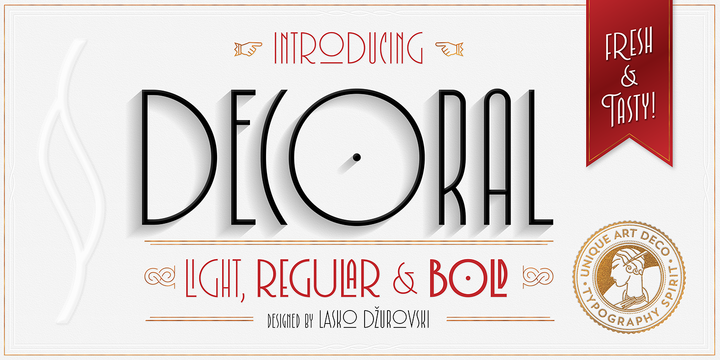 Inspired by Art Deco period typography, is suitable for modern typographic needs, logo, pacaking, title, display etc. Have fun! A font description published on Monday, January 15th, 2018 in Fonts, Lasko Dzurovski, Totem by Alexandra that has 1,450 views.